Visit several healthcare settings where e-prescribing has proven to be a viable and successful tool in the battle to overcome medication errors and control costs. While e-prescribing is not new, it still is not widely used. According to Alexandria, Va.-based SureScripts, through the end of 2007, only 35,000 prescribers—roughly 6%—used e-prescribing. Nonetheless, e-prescribing is a growing trend among physician offices, hospitals, and regional health networks. “As with the adoption of any technology, there is a learning curve. Getting doctors through the first few scripts is critical. Most doctors love it, and the patients love it as well,” says Peter Wilensky, vice president of corporate development and government affairs at ZixCorp, an e-prescribing service provider. He believes e-prescribing is a foundation or platform for introducing technology to physicians that can be built on. “Once the docs get started, it opens up the floodgates, and they adopt additional technology to deliver healthcare more safely and efficiently. Everybody wins: insurance companies, the patient, physicians, pharmacies. It just makes sense,” he says. Looking at the country as a whole, Wilensky finds that the Northeast has the strongest penetration of e-prescribing because of the forward-looking medical institutions and healthcare plans in that area. The top state for e-prescribing use is Massachusetts, with its academic centers, doctors, and Blue Cross Blue Shield of Massachusetts leading the charge. Rhode Island, New Jersey, Pennsylvania, and New Hampshire have also been successful in adopting the technology as a result of activity driven by state government or insurance plans. In the Midwest, Michigan leads the e-prescribing pack, most notably in the southeast corner of the state, where the three big automakers initiated a successful adoption drive. “There has been a lot of success there, with the local health plans championing the effort,” says Wilensky. However, other areas of the country have been slower to adopt e-prescribing. Based on the success in the Northeast, Wilensky says the key to employing the technology is having a leader who steps up to champion the program. In some cases, the government has been the driver. For example, in Illinois, the governor has decreed that he wants e-prescribing adopted by 2011 and has organized a statewide coalition to accomplish that goal. Some insurance companies also tout the benefits of e-prescribing for patient safety and economic reasons. “It increases patient safety, and healthier patients cost less money,” says Wilensky. E-prescribing also drives down drug costs because it encompasses not just the digital transmission of the prescription but also decision support about formulary information, medical history, and drug history. “By providing that information at the point of care, it helps physicians to make decisions that lead to a lower expenditure on drugs and a decrease in adverse drug events,” Wilensky says. To get prescription information, software development companies partner with others who have direct access to the information. For example, ZixCorp’s PocketScript e-prescribing services deliver information about patient-level eligibility, formularies, and copays. From the physician side, RxHub, the national patient health information network, supplies claim eligibility data, and once a patient panel is loaded into the database, it will find that particular patient and retrieve eligibility information and the appropriate formulary in real time. On the pharmacy side, SureScripts delivers dispensing information for the best medication history possible. Richard Friedland, MD, who has been in private practice for 20 years, started using iScribe’s Web-based e-prescribing tools two years ago. He estimates that nearly 90% of his prescriptions are submitted electronically, the remaining 10% being computer generated. When listing the system’s benefits, Friedland cites the efficiency and speed of transmitting a script, enhanced accuracy, the reduction of potential errors, and the added convenience it provides for the office, patients, and pharmacies. Jeffrey A. Kleiman, MD, a physician at the Caritas Good Samaritan Medical Practice Corporation in Brockton, Mass., has used e-prescribing for eight years via RxNT. “The biggest benefits concern safety and tracking. I can easily find out what medicine was prescribed, how much, and when at the click of a mouse,” he says. Kleiman notes that he hasn’t encountered information that cannot be shared via e-prescribing. “I even use the electronic prescribing to prescribe controlled substances. The prescriptions need to be printed on a special type of paper, but I have a record of what was prescribed,” he says. “Everybody likes it. The patients have become accustomed to it and have one less trip to the pharmacy. Pharmacies like it because they don’t feel rushed with the patient waiting for his prescription, and the e-prescriptions decrease the number of phone calls they have to take,” adds Friedland. Anyone who has received a handwritten prescription knows that reading a doctor’s penmanship can be challenging. Couple that with the countless number of look-alike drug names, and it’s easy to understand why e-prescribing proponents tout how the technology improves accuracy and decreases the need for pharmacy callbacks. Add it all together, and e-prescribing has made a positive impact on Friedland’s practice. “This is not a small thing. If e-prescribing is not a national trend yet, it will be one soon,” he says. Matthew Walsh, assistant vice president of purchaser initiatives for Health Alliance Plan, a subsidiary of Henry Ford Health System in Detroit, says the health system quickly realized the value of e-prescribing when it completed implementation in its patient care practices in 2005 and its specialty sites in 2006. Henry Ford’s EMR interfaces with the Rcopia e-prescribing system, a product of DrFirst Inc, a Rockville, Md.-based technology company. More than just an outlet for e-prescribing, the tool also moves any patient drug information back into the EMR. Walsh says prescribing electronically has benefited Henry Ford in three areas: increased patient safety, administrative savings, and increased generic use. Since 2005, the Michigan-based health system has written 4 million e-prescriptions and cancelled 370,000 drug-to-drug prescriptions and 27,000 drug-allergy prescriptions. Administratively, it has realized a time savings of four minutes per script. Also, the generic use rate has jumped from 56.7% to 74.8%, which saves money for health plans, employers, and patients. As for data security, Walsh says patients do not need to be worried about sensitive information being shared because Henry Ford’s application is HIPAA compliant and backed by password and identification requirements. “So it’s much more secure than the old process where a physician would write scripts on a script pad and that pad may be accessible to other people,” he says. Because the software is interfaced with the health system’s EMR, all patient health data are included securely in the record. The greatest barrier Walsh has observed with implementing e-prescribing is that the skills needed to make it successful aren’t what physicians are trained for in medical school. “A physician doesn’t generally have the experience with such things as choosing technology and system support but, luckily, there are resources that provide those skills to guide doctors through the choice and implementation process. Once the technology is in place, the physicians love it,” says Walsh. John D. Halamka, MD, MS, chief information officer of Harvard Medical School and of CareGroup in Boston, oversees Massachusetts’ statewide e-prescribing initiative known as MA-SHARE, a regional health information organization (RHIO) that links patients, providers, and pharmacies. He also serves as chief information officer at Boston’s Beth Israel Deaconess Medical Center, where all the clinics use e-prescribing. In his various capacities, Halamka knows firsthand the value and functionality of e-prescribing. Beth Israel Deaconess is one of the major players that has catapulted Massachusetts to the top of the e-prescribing charts, while MA-SHARE is renowned for its role in promoting the technology. “We built an electronic health record that talks to the statewide e-prescribing system, which in turn interfaces with our partners that include RxHub, SureScripts, and various payers. This really provides comprehensive information to physicians,” he says. Through MA-SHARE, when a physician is choosing a medication for a patient, the system will check the patient’s coverage, choose the proper formulary, provide information about drug-to-drug safety, route the prescription order to a pharmacy, and even check compliance. Because RxHub and SureScripts are nationwide, a patient needing a prescription from the Massachusetts RHIO can be anywhere in the United States, and the system will provide a physician with critical medical information and create a record of the transaction. Challenges aside, Halamka emphasizes the tremendous workflow benefit that e-prescribing provides for doctors and the convenience afforded to patients. For example, to renew a medication through e-prescribing, a patient could walk into a retail pharmacy to initiate a renewal rather than making a series of phone calls or faxes to complete the process. At Beth Israel Deaconess, patients have their own personal health records, which also improves the end-to-end communication of the entire e-prescribing process. “From the doctor’s brain to the patient’s vein, e-prescribing saves a lot of money for physicians, patients, and insurance companies,” says Halamka. The value of regional e-prescribing networks became clear in the wake of Hurricane Katrina. Kathy Mosbaugh, executive vice president of Informed Decisions, a Gold Standard company, describes how the company’s eMPOWERx patient care system with e-prescribing capabilities was utilized in the wake of the disaster. Initially, Gold Standard deployed its system in Florida, marrying drug information with real-time prescription histories of Medicaid beneficiaries for physicians to use in their practices for decision support. “We were successful by providing critical health information at the point of care. The information allowed the physician to make more informed decisions regarding the care of their patients,” Mosbaugh says. Continuity among providers was established to eliminate duplications, and physicians were able to electronically transmit prescriptions. In light of Florida’s success, Mississippi was also interested in eMPOWERx, and Informed Decisions was poised to deploy the program in the state when Hurricane Katrina hit. Three days after the hurricane’s landfall, the state was in need of critical help with obtaining prescription information from medical records. The federal government asked Informed Decisions to participate in a workgroup, along with organizations such as the American Medical Association and SureScripts, to establish a portal (to be known as KatrinaHealth.org) with drug information for those affected by the storm. To make KatrinaHealth.org successful, the eMPOWERx platform was expanded to allow authorized physicians and pharmacists to access medication histories over the Internet. Besides providing data to help healthcare professionals choose the proper prescription, the system can also run a clinical report to check for alerts, duplications, and drug interactions. With the success of KatrinaHealth.org, the program evolved into what is now called ICERx.org, or In Case of Emergency Prescription History Service. “Many of the partners of KatrinaHealth.org had put a great deal of effort into establishing the service and wanted the service to continue,” says Mosbaugh. The portal, which is available during an emergency, is HIPAA compliant, according to Mosbaugh, who adds, “Privacy laws vary by state, and some are more restrictive, so we established the program standards to meet the most restrictive.” The portal does not include information pertaining to HIV or mental health. Overall, the technology is gaining the desired results. “Patients are on fewer and less expensive medications because it stops duplication and waste in the system. It enhances the ability to prescribe the right medication for the right patient at the right time,” Mosbaugh says. Walk into your neighborhood pharmacy, and you’re likely to see a sign urging patients to get a “jump-start” on their prescriptions by using or asking their physicians to use e-prescribing. In a nationwide campaign to educate patients about the technology’s benefits and convenience, SureScripts, which operates the Pharmacy Health Information Exchange, hopes to raise awareness among healthcare consumers and boost demand for e-prescribing by establishing a dialogue between patients and physicians. Signs and brochures promoting e-prescriptions are available in thousands of participating pharmacies across the nation. In addition, the campaign’s Web site, www.LearnAboutEprescriptions.com, describes the technology and allows consumers to search by zip code for participating physicians or pharmacies. According to SureScripts, although more than 70% of the nation’s community pharmacies can receive e-prescriptions, only 6% of physicians have the ability to send them. The Web site provides consumers with the necessary information to approach their physicians about adopting the technology. Patients can either e-mail or print helpful tips that show their doctors how e-prescriptions benefit both consumers and physicians by saving time and money and improving quality of care. Patients can also direct nonparticipating physicians to www.GetRxConnected.com, a Web site launched by several leading physician groups that provides instructions on how to get started. For the latest information, visit www.surescripts.com. The nation’s retail pharmacies and pharmacy benefit managers (PBMs) recently announced a collaboration to unite the country’s two leading health information networks. 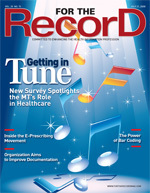 The groups have merged two organizations: RxHub, founded in 2001 by the nation’s three largest PBMs (CVS Caremark Corporation, Express Scripts, Inc, and Medco Health Solutions, Inc) and SureScripts, also formed in 2001 by the National Association of Chain Drug Stores (NACDS) and the National Community Pharmacists Association (NCPA). The organizations will consolidate their operations, forming a single, secure, nationwide network for e-prescriptions and the exchange of health information. RxHub’s expertise in patient identification and delivering drug benefit information to physicians at the point of care complements SureScripts’ focus on e-prescription routing from the physician’s office to the pharmacy. The merger combines these strengths with a shared focus on more access to patient medication histories to form a single suite of comprehensive services. The new organization will enable physicians to securely access vital health information when caring for their patients through a fast and efficient health information exchange, allowing them to transmit e-prescriptions and renewal requests to both retail and mail order pharmacies.